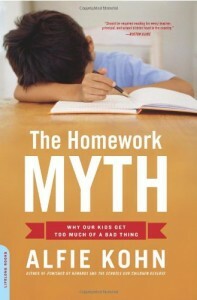 A compelling exposé of homework – how it fails our children, why it’s so widely accepted, and what we can do about it. Death and taxes come later; what seems inevitable for children is the idea that, after spending the day at school, they must then complete more academic assignments at home. The predictable results: stress and conflict, frustration and exhaustion. Parents respond by reassuring themselves that at least the benefits outweigh the costs. But what if they don’t? In The Homework Myth, Alfie Kohn systematically examines the usual defenses of homework – that it promotes higher achievement, “reinforces” learning, teaches study skills and responsibility. None of these assumptions, he shows, actually passes the test of research, logic, or experience. So why do we continue to administer this modern cod liver oil – or even demand a larger dose? Kohn’s incisive analysis reveals how a mistrust of children, a set of misconceptions about learning, and a misguided focus on competitiveness have all left our kids with less free time and our families with more conflict. Pointing to parents who have fought back – and schools that have proved educational excellence is possible without homework — Kohn shows how we can rethink what happens during and after school in order to rescue our families and our children’s love of learning. 3 Does Homework Provide Nonacademic Benefits? 4 “Studies Show…” – Or Do They? “Kohn takes many of the things we assume about homework and shreds them, showing over and over how little research there is to back up all the accepted theories. . . . [He] chip[s] away at the conventional thinking that homework improves achievement, that homework improves grades, that homework builds character and all the other things we’ve heard about it since we were doing it . . . Worse, [it] may have the adverse effect of dulling a child’s interest in learning altogether.